Learning is a complex process that is not easily defined. ated as the effect of disease, tiredness, or drug use (Seif, 2008). learner’s ideas and beliefs about learning (Lai & Chan, 2005). and development is at the highest level (Lai & Chan, 2005). are in the hierarchy and the better their academic achievement. dents’ conceptions of learning and their learning results. achievement (Hong & Salili, 2000; Purdie et al., 1996). G. H. ALAMDARLOO ET AL. ing, the better their academic achievement. seeks to answer the following questions. academic achievement for pre-university students in Iran? dicting the academic achievement of pre-university students? a mean age of 17.39 and standard deviation of .78.
in special lessons determined by Iran’s Ministry of Education. sonal change (r = 0/36). academic achievement [F(1, 307) = 53.65, p < .001, R2 = .15]. of learning were compared using ANOVA. ber of conceptions of learning [F(6, 302) = 11.76, p < .0001)]. Means and standard deviations (SD) of the research variables. Matrix of conceptions of learning and academic achievement. Results of step-by-step regression of academic achievement based on conceptions of learning. Mean and standard deviation of academic achievement on the basis of number of conceptions of learning. Changing resources Sum of squares Freedom degree Sum of squares mean F Sig. Results of a Scheffe test to compare academic achievement on the basis of the number of conceptions of learning. Group Compared group Mean difference Sig. students who have only surface conception of learning. Elawar, 2004; Dart et al., 2000; Norton & Crowley, 1995). than that of those who do not have any conceptions of learning. sponsible for their own learning and to learn more strategically. with an emphasis on adult outcomes. Filipino students. Th e J o u r n a l o f G e n e t i c Psychology, 164, 101-114. Boulton-Lewis, G. M., Marton, F., Lewis, D. C., & Wilss, L. A. (2000). secondary school students’ conceptions and beliefs about learning. European Journal of Psychology of Education, 19, 167-187. Psychology in Chinese Societ i e s, 1, 1-12. Klatter, E. B., Lodewijks, H. G. L. C., & Aarnouste, C. A. J. (2001). education. Learning and Instruction, 11, 485-516.
assessment. Master’s Thesis, Hong Kong: University of Hong Kong. Marton, F., Dall’Alba, G., & Beaty, E. (1993). Conceptions of learning. International Journal of Educational Research, 19, 227-300.
academic achievement? Teaching in Higher Education, 6, 399-413.
achievement. Learning and Individual Differences, 20, 167-176.
cultural comparison. 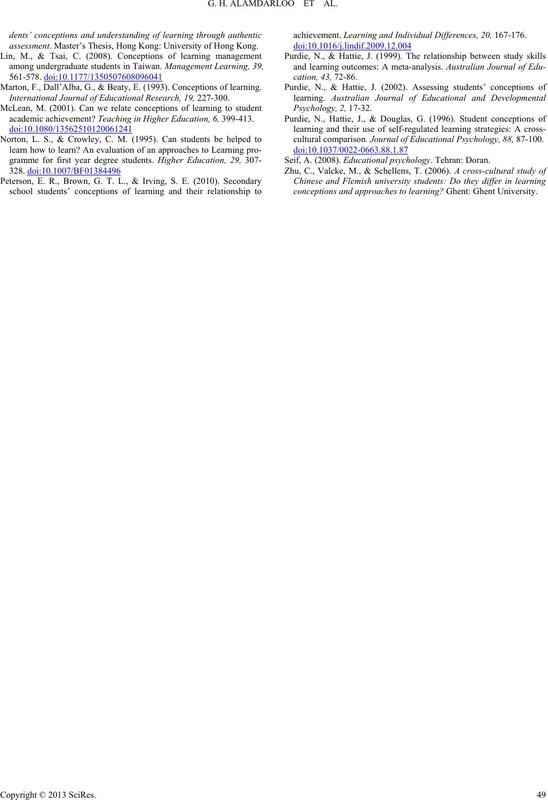 Journal of Educational Psychology, 88, 87-100. Seif, A. (2008). Educational psychology. Tehran: Doran. conceptions and approaches to learning? Ghent: Ghent University.